The mechanisms of wound healing in general have gained interest in recent years, as it has become obvious that the tightly regulated process of tissue repair and regeneration is of great importance for organ homeostasis. Insufficient as well as excessive tissue repair both impair gastrointestinal function. Formation of ulcers and fistulas on the one hand, and of fibrosis and stricture on the other, represent just two sides of one medal. So far, the physiological pathways involved in intestinal wound healing are only partially understood. During acute and chronic intestinal inflammation, macrophages and neutrophils induce local tissue damage by secreting reactive oxygen radicals and tissue-degrading enzymes. This is followed by the release of pro-inflammatory cytokines, as well as chemotactic and cell-activating peptides previously bound to the matrix. If tissue damage is severe, myofibroblasts migrate to the sites of the defect. This migratory function, the ability to contract the wound area and the production of extracellular matrix (ECM) by intestinal myofibroblast cells certainly have important roles in the physiological situation and are altered by chronic inflammation. Available treatments of intestinal strictures, fibrosis and fistulas are insufficient and unsatisfactory. New therapeutic approaches are urgently needed. Future intervention should involve stronger and more selective prevention of the continuous tissue damage and a change in wound healing by modulation of myofibroblast migration and ECM synthesis. Despite an extensive and detailed investigation on the immunological pathways involved in chronic inflammation in recent years, the physiology and pathophysiology of mucosal wound healing has remained widely unexplored. This is surprising because insufficient (abscess, fistula) or excessive wound healing (fibrosis) is the main indication for surgery in patients with Crohn’s disease.16–21 The therapeutic problems caused by bowel wall fibrosis are common18: about 75% of all patients with Crohn’s disease have to undergo surgery at least once during the course of their disease.22,23 In half of these patients, intestinal obstructions and strictures are the indications for surgery. This means that intestinal obstructions require abdominal surgery in about one third of all patients with Crohn’s disease.22,23 In >45% of patients with Crohn’s disease, these obstructions are recurrent.24 Owing to limited pathophysiological insights, good conservative treatment options are unavailable to prevent stricture formation and fibrosis. In contrast with anti-inflammatory treatment, little therapeutic progress has been made with respect to intestinal fibrosis.25 Current preventive attempts therefore rest primarily on long-term anti-inflammatory treatment.16,26,27 However, this mainly anti-inflammatory approach is often ineffective, leading to surgery and stricturoplasty, which remain the major treatment methods for intestinal fibrosis.28 Unfortunately, even the surgical approach is often only associated with short-term resolution of symptoms, as strictures tend to recur. Several non-surgical procedures for the treatment of strictures, such as balloon dilatation17,29–35 or polyvinyl over-the-guidewire dilatation,36 have been reported, which are still controversial. Injection of glucocorticoids into the strictures after dilatation also has been suggested.37 An effective prevention of fibrosis and stricture formation, therefore, would be a major progress. At this point in time, we are just beginning to understand the mechanisms that lead from intestinal inflammation to fibrosis. Current concepts view fibrosis as a reactive process. A chronic or recurrent inflammation is considered a necessary precondition for the initiation of intestinal fibrosis. In this view, fibrosis is a pathologically augmented healing response to inflammation-induced destruction and injury of mucosal tissue. However, what triggers increased fibrosis in some patients and not in others is still unclear. As mesenchymal cells—fibroblasts, myofibroblasts and smooth-muscle cells—are the main producers of ECM components that are deposited during fibrosis, these cells may be regarded as one central player or the effectors of intestinal fibrosis. Therefore, after highlighting the mechanisms involved in inflammatory tissue damage, the role of fibroblasts and myofibroblasts during intestinal fibrosis will be discussed. In the authors’ view, there is no primary defect or malfunction in these cells that leads to fibrosis. They react to the given intestinal environment with enormous plasticity, but exactly in the way they are programmed to. Therefore, we have to understand these conditions and mediators, as well as the primary programming of intestinal mesenchymal cells, to be finally able to develop new treatment approaches. Inflammation is associated with an infiltrate of immune cells, such as T cells, macrophages and neutrophils, and it also often causes severe damage to the tissue in which it occurs. In the case of intestinal mucosa, severe inflammation is followed by a loss of epithelial cells and a degradation of ECM in the lamina propria, clinically leading to ulcerations (fig 1). Enzymes and mediators mainly secreted by monocytes, intestinal macrophages and granulocytes are responsible for this tissue damage. 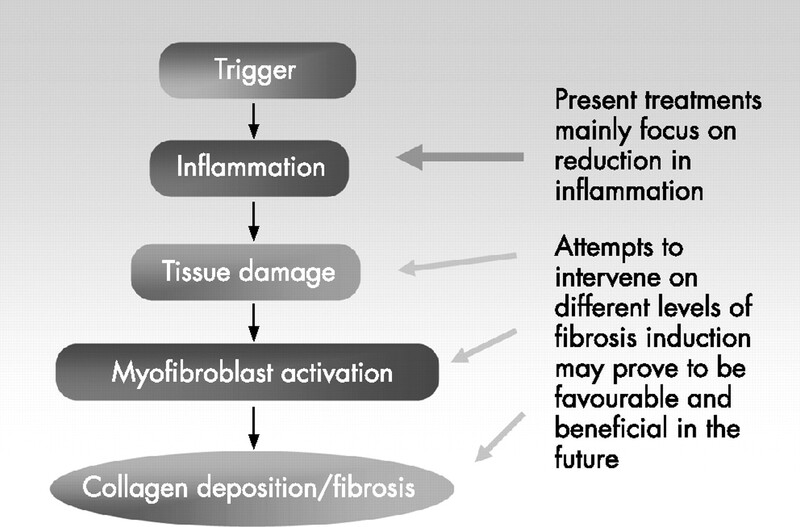 This continuous inflammation and tissue degradation may consequently lead to fibrosis and stricture formation (fig 1). Fibrosis in the colon: the clinical problem. Ulcerations and tissue damage (black arrow) are caused by chronic inflammation. This is followed by bowel wall fibrosis, leading to pseudopolyps (blue arrow) or strictures reducing the colon lumen (white arrows). Oxidants are important contributors to mucosal, and eventually submucosal, tissue destruction (fig 2). Oxygen metabolites, such as oxygen or hydroxide radicals, are produced in large amounts by infiltrating leucocytes in the inflamed mucosa.38 The normal intestinal wall contains relatively small amounts of antioxidative enzymes.39 The production of superoxide and other reactive oxygen intermediates is catalysed by a membrane-associated nicotinamide adenine dinucleotide phosphate (NADPH) oxidase.40 The enzyme system responsible for superoxide generation forms a small transmembrane electron transport system that results in the oxidation of NADPH on the cytoplasmic surface and the generation of a superoxide on the outer surface of the membrane. It is a heterodimer composed of a 91-kDa glycoprotein (termed gp91-phox, for the 91-kDa glycoprotein of phagocyte oxidase) and a 22-kDa polypeptide (p22-phox).41 In addition to the cytochrome b heterodimer, four cytosolic factors (p47-phox, p67-phox, p40-phox and p21 Rac) are required for NADPH oxidase activity. The enzyme is dormant in resting cells and becomes active on stimulation. Induction of NADPH oxidase expression in intestinal macrophages from inflamed mucosa associated with increased oxidative burst activity has recently been shown.42 Inhibition of this oxygen radical secretion ameliorates experimental colitis in mice (unpublished data). Inflammation and degradation of extracellular matrix (ECM). During severe and chronic intestinal inflammation, activated local macrophages or neutrophils secrete oxygen radicals, cathepsins and matrix metalloproteinases (MMPs), leading to degradation of ECM. This is followed by a release of pro-inflammatory cytokines from ECM-binding sites, which further activate the leucocytes. 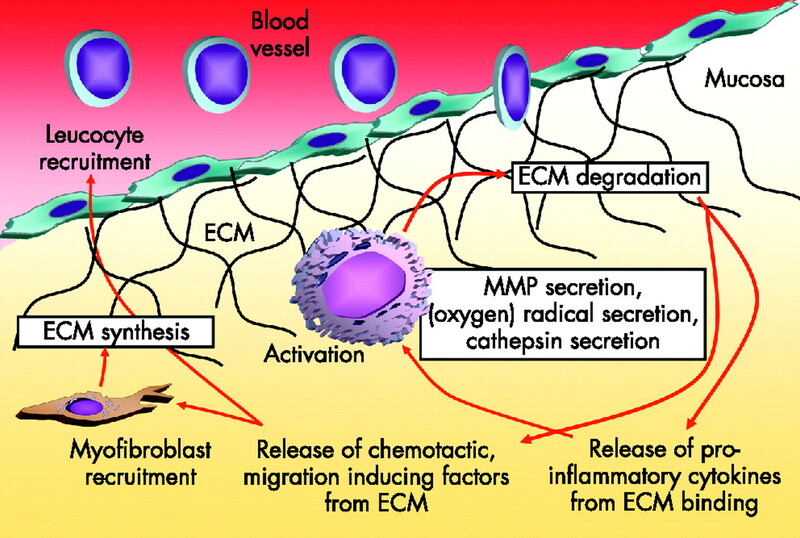 In addition, chemotactic, migration-inducing factors are released from ECM, causing an increase in infiltration of leucocytes evading from the blood vessel through the endothelium, finding a paved way through the degraded ECM. The same factors attract myofibroblasts, which synthesise ECM, in an attempt to limit the process. Besides radical formation, infiltrating and locally activated immune cells respond to intestinal inflammation by secreting ECM-modifying and ECM-degrading enzymes43 (fig 2). This permits further infiltration of immune and non-immune cells into the inflamed area, finally paving the way for the migration of myofibroblasts (fig 2). Two major groups of proteinases are secreted: serine proteases such as elastases or collagenases (degrade elastin, fibronectin, laminin, collagen and proteoglycans) and matrix metalloproteinases (MMPs). In contrast with MMPs, which are usually secreted as inactive pro-forms (zymogens), elastases are stored intracellularly in neutrophils and monocytes or in macrophages in their active form.43 The MMP family of enzymes consists of at least 15 distinct members, nine of which are expressed in leucocytes. All MMPs degrade ECM components. Their activity is regulated by inhibiting enzymes called tissue inhibitors of metalloproteinases (TIMPs). The balance between the tissue-degrading MMPs and their inhibitors is important for the degree of intestinal wall damage during inflammation. GENETIC CONTROL OF WOUND HEALING AND FIBROSIS? If the defect is deeper, with subepithelial tissue damage, the area below the basement membrane has to be reconstituted in addition to the epithelial surface (fig 3). One of the key events in that process is the contraction of the underlying lamina propria to limit the wound area the epithelium finally has to cover. A rapid wound closure is important to reduce the time of impaired barrier function of the intestinal wall. Recent studies have provided evidence for the deleterious consequences of an uncontrolled and longlasting translocation of bacteria from the gut lumen into the mucosal wall.53 It is crucial to prevent bacterial translocation, or—if impossible—to rapidly detect and sense translocated bacteria, a lesson we learnt from the first susceptibility gene for Crohn’s disease, NOD2/CARD15.53 In fact, variants of NOD2/CARD15 causing an increased risk of developing Crohn’s disease are also associated with a higher frequency of fibrosing and stricturing disease.54–59 Further clinical evidence suggests a genetically determinated risk to develop strictures. Some patients obviously have rapidly recurring strictures, whereas others permanently have an inflammatory, non-stricturing disease type (fig 4). 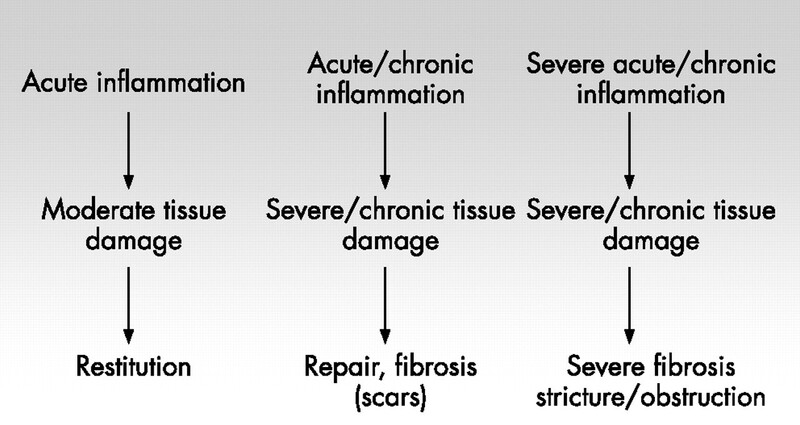 Severity of inflammation and tissue repair. Acute intestinal inflammation is normally followed by moderate or limited tissue damage and complete restitution. A more severe acute or moderate chronic inflammation may result in severe or chronic tissue degradation and damage, followed by repair, and may also be accompanied by fibrosis and scars. However, severe acute and longlasting chronic tissue damage may be associated with severe fibrosis, leading to intestinal strictures and obstruction. Stricture formation. Genetic influence or consequence of aggressive inflammation? 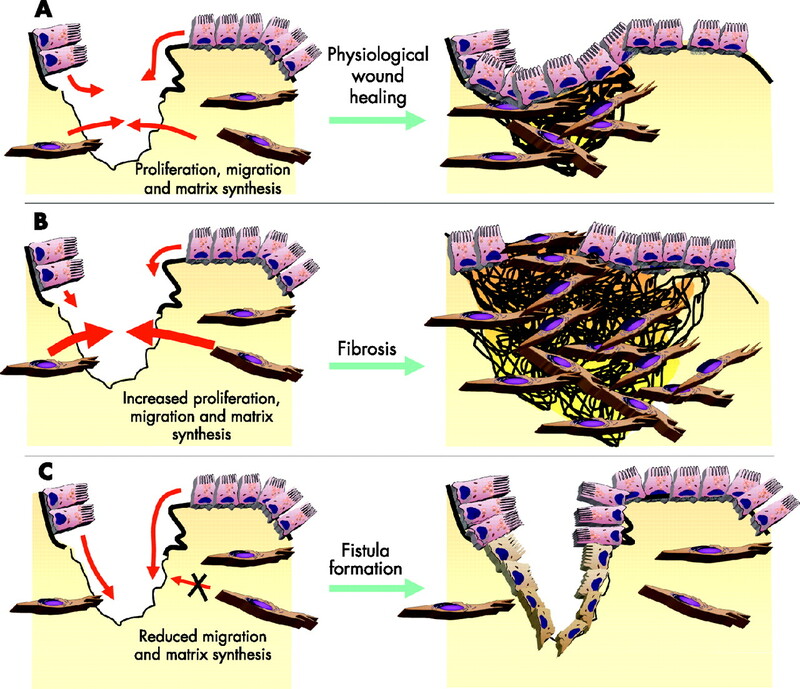 After injury, tissue repair and wound healing take place, involving new tissue formation and scar constitution.63 Owing to their contractile and migratory ability and their competence in secreting matrix proteins and growth factors, fibroblasts, myofibroblasts and smooth-muscle cells have an important role in both the reconstitution and the repair processes. Recent years have generated evidence that there is a phenotypic heterogeneity among fibroblasts in general and specifically among intestinal wall fibroblasts.48,64–66 Some fibroblast types have features of smooth-muscle cell differentiation. These cells were termed myofibroblasts.67 Myofibroblasts play an important part in tissue growth and development in different tissues.13,68 They are central players during tissue repair that may finally lead to local or generalised fibrosis and stenosis (fig 5). Whether myofibroblasts are a distinct cell type or a differentiation state of fibroblasts is still debatable.69 They are defined morphologically and immunologically mainly by the expression of cytoskeletal proteins.13 Among these specific features are prominent cytoplasmic actin microfilaments (stress fibres) and the formation of intercellular connections via adherens and gap junctions.70 The simplest definition used in the literature is based on the expression of α-smooth-muscle actin (α-SMA). Some authors see myofibroblasts as an intermediate state between fibroblasts and smooth-muscle cells (fig 5). However, it is unknown whether they originate from one of these two cell types in vivo. Other classifications use filament proteins as a means of differentiation also to define myofibroblasts. Besides α-SMA, vimentin and desmin are often described.71 On the basis of the expression of filament protein, Powell71 proposed a classification of myofibroblasts: myofibroblasts expressing only vimentin are “V type”, those expressing vimentin and desmin are “VD type”, those additionally expressing α-SMA are “VAD type”, those expressing vimentin and α-SMA are “VA type” and those expressing vimentin and myosin are “VM type”. Whether these phenotypes and differences in the expression of cytoskeletal proteins are associated with functional differences is presently unknown. In the intestinal mucosa, two types of myofibroblasts are found under physiological conditions. 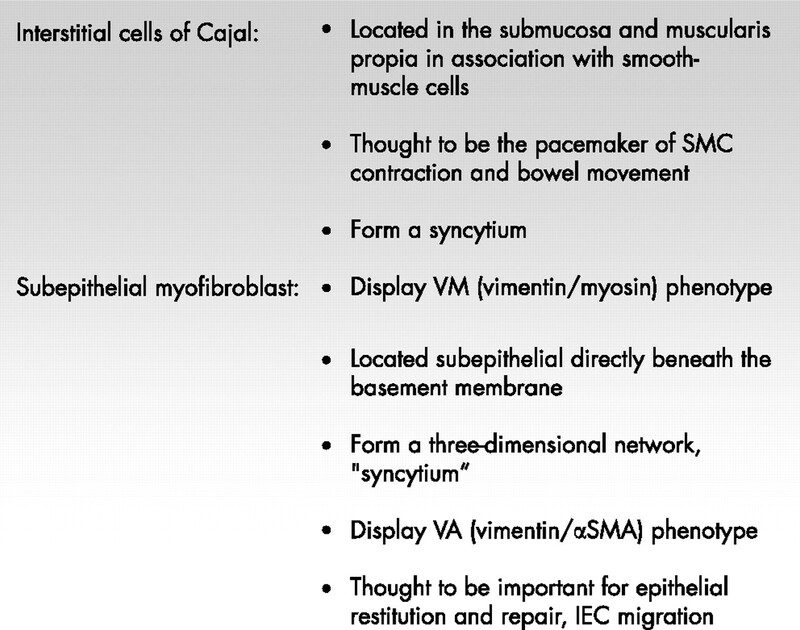 Besides the subepithelial myofibroblasts, the interstitial cells of Cajal have a myofibroblast phenotype (fig 6). The interstitial cells of Cajal are located in the submucosa and muscularis propria in association with the smooth-muscle layer of the gut. It is unknown whether subepithelial myofibroblasts and interstitial cells of Cajal-like T cells differentiate from a common precursor (an MF0 cell, or which factors induce this differentiation fig 5). Both types of myofibroblasts form a network or “syncytium”; however, it is unclear whether or not both networks are connected. The subepithelial myofibroblasts mainly located at the bases of intestinal crypts in the lamina propria are morphologically well characterised. Their functional capacity is nevertheless widely unexplored.71 They form a three-dimensional network and communicate with each other by gap and adherens junctions, but also keep up connections with epithelial cells through fenestrations in the basement membrane. They also interact with intestinal macrophages. Whereas the interstitial cells of Cajal have the V or VM phenotype, the subepithelial myofibroblasts have the VA type71 (fig 6). Platelet-derived growth factor (PDGF) seems to be essential for the differentiation and development of myofibroblasts (fig 5). Besides PDGF and TGFβ, insulin-like growth factor I (IGFI) and interleukin (IL)4 may be factors relevant for the transdifferentiation of fibroblasts to myofibroblasts72 (fig 5). Characteristics of the two types of myofibroblasts found in the bowel wall. IEC, intestinal epithelial cells; SMA, smooth-muscle cell actin; SMC, smooth-muscle cell. ARE MYOFIBROBLASTS THE ONES TO BLAME? Despite the characteristics of “activated” cells, it must be kept in mind that subepithelial myofibroblasts display these characteristics physiologically and that usually an activation means a change of function from a resting or inactive state to increased secretion of cellular products. This change does not occur for subepithelial myofibroblasts and it is somewhat a contradiction to talk about constitutively activated cells. The migratory response of subepithelial myofibroblasts isolated from the mucosa of patients with Crohn’s disease is markedly reduced when compared with that of cells isolated from controls.87 In myofibroblasts from normal mucosa, a similar persistent reduction in migration can be induced by incubation with TNF or interferon (IFN)γ.87 How this reduced migratory potential contributes to fibrosis in inflammatory bowel disease is still unclear. In other organs, fibroblasts isolated from diseased tissue often have either an enhanced or a reduced migratory potential, depending on the type of disease. Suganuma et al88 examined fibroblasts from patients with interstitial lung fibrosis associated with a collagen vascular disease and from patients with sarcoidosis. Fibroblasts from tissues with dense fibrosis showed a higher migratory potential towards PDGF than that of fibroblasts from a tissue in an earlier stage of fibrosis.88 Pontz et al89 screened fibroblast strains derived from patients with mucopolysaccharidosis. Whereas the synthesis of major ECM components was close to normal, the response of the fibroblasts from patients with mucopolysaccharidosis to chemotactic stimuli was greatly reduced. These studies indicate that changes in the migratory potential of mesenchymal cells are often associated with the development of fibrosis in different organs. However, they also show that the specific pathogenesis of each disease can either increase or reduce this migratory potential. It may be speculated that fibroblast and myofibroblasts respond in a programmed way to the conditions they find in the tissue. They therefore are not to blame for the initiation of tissue fibrosis. They react as they are programmed, so the reasons for the ongoing activation of myofibroblasts need to be elucidated. TNF can function as a chemoattractant and an activator of migration for skin fibroblasts.93 However, intestinal myofibroblasts respond differently to TNF and show reduced migration under the influence of TNF.87 Thus, the influence of TNF on myofibroblast migration seems to be tissue specific. Tyrosine phosphorylation of p125 focal adhesion kinase (FAK) is a central regulator of cell migration in health and disease (fig 7).94 FAK is a non-receptor protein tyrosine kinase involved in integrin-mediated control of cell behaviour. The amounts of both cytosolic FAK protein and its phosphorylation normally increase during cell migration.95 FAK becomes phosphorylated at multiple sites, including tyrosine 397 (fig 7), which is a marker for the activation of FAK. Phosphorylation at this residue creates an Src homology 2-binding site for different signalling and adapter proteins.95 FAK-deficient fibroblasts exhibit defects in cell migration and a raised number of cell–substratum contact sites. Mechanisms of myofibroblast migration. 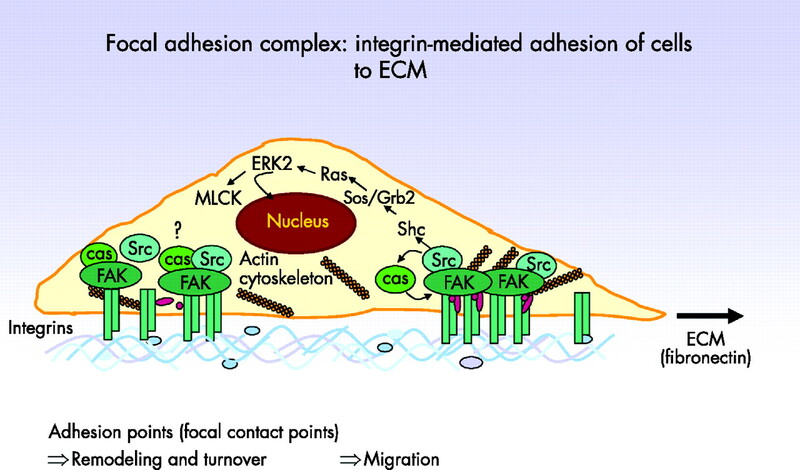 Integrin receptors extracellularly mediate contacts to the extracellular matrix (ECM) and also provide ECM signals for the induction of migration. Focal adhesion kinase (FAK) is associated with integrins, and after activation is phosphorylated, consecutively leading to activation of several kinases in a subsequent signal transduction cascade. As a consequence, the actin cytoskeleton is remodelled and a focal contact point containing high numbers of integrin molecules is moved in the membrane, thereby allowing cell migration. In the pathophysiology of intestinal stricture formation, a locally increased proliferation of mucosal myofibroblasts may occur. They exhibit a high proliferation rate coincident with the reduced migratory potential. Consequently, a local increase in cell number with reduced dispersing potential may lead to ineffective wound contraction and increased deposition of ECM, finally leading to tissue fibrosis (fig 8A, B). On the other hand, the reduced migratory potential of myofibroblasts from patients with Crohn’s disease could result in less migration of cells into the transmucosal wound areas, followed by proliferation of epithelial cells into these defects and finally the formation of fistulas (fig 8C). However, these models remain speculative, as the growth factor-induced migration of fibroblasts or the complex interaction of fibroblasts with immune cells or epithelial cells certainly have an important role also in wound healing, and no experimental data are available so far to decide which hypothesis is more reliable and promising. Schematic representation of (A) normal wound healing, (B) fibrosis and (C) fistula formation, with effect on the role of fibroblasts. In the case of fibrosis, increased proliferation, migration and matrix synthesis occurs. In the pathogenesis of fistulas, reduced migration of myofibroblasts and synthesis of extracellular matrix is the problem. Epithelial cells try to close the wound area and migrate in the defect. A chronic or recurrent inflammation causing chronic or recurrent tissue damage is considered a necessary condition for the initiation of intestinal fibrosis. Hypotheses for the development of strictures in IBD or other forms of enteritis often suggest an ongoing activation of collagen-producing myofibroblasts. In acute injury, the normal intestinal architecture is restored by post-transcriptional and post-translational mechanisms that prevent the net accumulation of ECM and fibrogenic cells. By contrast, during fibrosis, ECM accumulates and is not degraded at appropriate levels, whereas fibrogenic cells proliferate. Therefore, efforts should focus on exploring the mechanisms to prevent the activation of myofibroblasts. A relevant role of TGFβ has also been shown in experimental models of intestinal fibrosis.77,78 No good model for intestinal fibrosis is yet available to easily study pathophysiology and potential therapeutic strategies. The experimental models for studying TGF-mediated effects on intestinal fibrosis are specific, and TGF inhibition in models of severe colitis has been found to have disadvantages. This might be because TGFβ is also an important inductor of regulatory T cells. The inhibition of TGF may therefore reduce fibrosis but increase inflammation and tissue damage, which could be deleterious in the case of the intestinal wall. There are concerns that a general inhibition of TGF might be followed by insufficient wound healing, making unspecific anti-TGF treatment an unsuccessful approach. These concerns are even greater with respect to the intestinal wall and barrier. Impaired wound healing would cause persisting ulcers and tissue defects, making the barrier even more leaky than it is. In addition to ECM synthesis, studies have been conducted on MMP expression as an important matrix-degrading system and its inhibitory counterpart TIMP in intestinal fibrosis. Interestingly, mesenchymal cells from the mucosa of patients with IBD showed increased levels and activity of MMP1, MMP2 and MMP3.25,112 Other reports indicate a normal expression of MMPs, with increased TIMP expression and activity.102 This was suggested as a potential mechanism for intestinal fibrosis and stricture formation, causing an accumulation of ECM via TIMP1-mediated inhibition of MMP activity.102 However, the data are not completely conclusive, and it is doubtful whether matrix deposition in intestinal fibrosis can be explained by an imbalance of the MMP–TIMP system. Our knowledge of factors that normally interrupt or stop the process of intestinal fibrosis is limited. However, recent evidence suggests that suppressor of cytokine signalling (SOCS) proteins might be involved in limiting a fibrogenic tissue response. The SOCS proteins are a family of Src homology 2 domain-containing proteins. Currently, there are eight members of the SOCS family, of which some have been implicated in the negative regulation of signal transduction pathways induced by cytokines and growth factors.113 SOCS2 binds to type I IGFI receptor. In SOCS2-deficient mice, SOCS2 normally limits basal, IGFI-induced intestinal growth.114 Similarly, SOCS3 might be a mediator that limits growth factor action.115,116 Further studies will be required to show whether these findings lead to new therapeutic options. Further efforts and consecutive understanding of the pathophysiology of intestinal fibrosis will hopefully lead to new strategies and treatments that interrupt stricture formation, improving the outcome for patients who now have to undergo recurrent surgery. Although efforts for the development of anti-inflammatory treatments for patients with IBD have been extensive, treatments for fibrosis and fistulas in IBD are still lacking. As a first step, further studies are necessary to deepen our understanding of the mechanisms responsible for fibrosis in the mucosal (fig 9). This has to include the evaluation of inflammatory and anti-inflammatory mediators and their sources responsible for intestinal tissue damage, as well as mediators influencing the three main functions of mesenchymal cells in wound repair—migration, proliferation and ECM synthesis—in IBD in vitro and in vivo. This may lead to the development of treatments for modifying the wound-healing response and may offer advantages over current treatments. Potential strategies for future therapies. Present treatments mainly attempt to reduce inflammation. Attempts to intervene on different levels of fibrosis induction and development may prove to be favourable and beneficial in the future. Strup-Perrot C, Mathe D, Linard C, et al. Global gene expression profiles reveal an increase in mRNA levels of collagens, MMPs, and TIMPs in late radiation enteritis. Am J Physiol Gastrointest Liver Physiol2004;287:G875–85. Vozenin-Brotons MC, Milliat F, Linard C, et al. Gene expression profile in human late radiation enteritis obtained by high-density cDNA array hybridization. Radiat Res2004;161:299–311. Bower TC. Ischemic colitis. Surg Clin North Am1993;73:1037–53. Cappell MS. Intestinal (mesenteric) vasculopathy. II. Ischemic colitis and chronic mesenteric ischemia. Gastroenterol Clin North Am1998;27:827–60. Lloyd-Still JD, Beno DW, Kimura RM. Cystic fibrosis colonopathy. Curr Gastroenterol Rep1999;1:231–7. Connett GJ, Lucas JS, Atchley JT, et al. Colonic wall thickening is related to age and not dose of high strength pancreatin microspheres in children with cystic fibrosis. Eur J Gastroenterol Hepatol1999;11:181–3. Pawel BR, de Chadarevian JP, Franco ME. The pathology of fibrosing colonopathy of cystic fibrosis: a study of 12 cases and review of the literature. Hum Pathol1997;28:395–9. Eggermont E. Gastrointestinal manifestations in cystic fibrosis. Eur J Gastroenterol Hepatol1996;8:731–8. Freiman JP, FitzSimmons SC. Colonic strictures in patients with cystic fibrosis: results of a survey of 114 cystic fibrosis care centers in the United States. J Pediatr Gastroenterol Nutr1996;22:153–6. Zerin JM, Kuhn-Fulton J, White SJ, et al. Colonic strictures in children with cystic fibrosis. Radiology1995;194:223–6. West AB, Losada M. The pathology of diverticulosis coli. J Clin Gastroenterol2004;38:S11–16. Boulos PB. Complicated diverticulosis. Best Pract Res Clin Gastroenterol2002;16:649–62. Powell DW, Mifflin RC, Valentich JD, et al. Myofibroblasts. II. Intestinal subepithelial myofibroblasts. Am J Physiol1999;277:C183–201. Wiener MD. Collagenous colitis and pulmonary fibrosis. Manifestations of a single disease? J Clin Gastroenterol1986;8:677–80. Giardiello FM, Bayless TM, Jessurun J, et al. Collagenous colitis: physiologic and histopathologic studies in seven patients. Ann Intern Med1987;106:46–9. Van Assche G, Geboes K, Rutgeerts P. Medical therapy for Crohn’s disease strictures. Inflamm Bowel Dis2004;10:55–60. Singh VV, Draganov P, Valentine J. Efficacy and safety of endoscopic balloon dilation of symptomatic upper and lower gastrointestinal Crohn’s disease strictures. J Clin Gastroenterol2005;39:284–90. Freeman HJ. Natural history and clinical behavior of Crohn’s disease extending beyond two decades. J Clin Gastroenterol2003;37:216–19. Tichansky D, Cagir B, Yoo E, et al. Strictureplasty for Crohn’s disease: meta-analysis. Dis Colon Rectum2000;43:911–19. Greenway SE, Buckmire MA, Marroquin C, et al. Clinical subtypes of Crohn’s disease according to surgical outcome. J Gastrointest Surg1999;3:145–51. Fazio VW, Tjandra JJ, Lavery IC, et al. Long-term follow-up of strictureplasty in Crohn’s disease. Dis Colon Rectum1993;36:355–61. Farmer RG, Whelan G, Fazio VW. Long-term follow-up of patients with Crohn’s disease. Relationship between the clinical pattern and prognosis. Gastroenterology1985;88:1818–25. Andres PG, Friedman LS. Epidemiology and the natural course of inflammatory bowel disease. Gastroenterol Clin North Am1999;28:255–81. Whelan G, Farmer RG, Fazio VW, et al. Recurrence after surgery in Crohn’s disease. Relationship to location of disease (clinical pattern) and surgical indication. Gastroenterology1985;88:1826–33. Pucilowska JB, Williams KL, Lund PK. Fibrogenesis. IV. Fibrosis and inflammatory bowel disease: cellular mediators and animal models, Am J Physiol Gastrointest Liver Physiol2000;279:G653–9. Fiocchi C. Inflammatory bowel disease: etiology and pathogenesis. Gastroenterology1998;115:182–205. Sartor RB. Current concepts of the etiology and pathogenesis of ulcerative colitis and Crohn’s disease. Gastroenterol Clin North Am1995;24:475–507. Graham MF. Pathogenesis of intestinal strictures in Crohn’s disease—an update. Inflamm Bowel Dis1995;1:220–27. Sabate JM, Villarejo J, Bouhnik Y, et al. Hydrostatic balloon dilatation of Crohn’s strictures. Aliment Pharmacol Ther2003;18:409–13. Legnani PE, Kornbluth A. Therapeutic options in the management of strictures in Crohn’s disease. Gastrointest Endosc Clin North Am2002;12:589–603. Kaila VL, el-Newihi HM, Mihas AA. Successful endoscopic dilation of a Crohn’s colonic stricture. Gastrointest Endosc1996;44:359–60. Van Gossum A, Gay F, Cremer M. Enteroliths and Crohn’s disease stricture treated by transendoscopic balloon dilation. Gastrointest Endosc1995;42:597. Couckuyt H, Gevers AM, Coremans G, et al. Efficacy and safety of hydrostatic balloon dilatation of ileocolonic Crohn’s strictures: a prospective longterm analysis. Gut1995;36:577–80. Gevers AM, Couckuyt H, Coremans G, et al. Efficacy and safety of hydrostatic balloon dilation of ileocolonic Crohn’s strictures. A prospective long-term analysis. Acta Gastroenterol Belg1994;57:320–2. Shen B, Fazio VW, Remzi FH, et al. Endoscopic balloon dilation of ileal pouch strictures. Am J Gastroenterol2004;99:2340–7. Morini S, Hassan C, Cerro P, et al. Management of an ileocolic anastomotic stricture using polyvinyl over-the-guidewire dilators in Crohn’s disease. Gastrointest Endosc2001;53:384–6. Brooker JC, Beckett CG, Saunders BP, et al. Long-acting steroid injection after endoscopic dilation of anastomotic Crohn’s strictures may improve the outcome: a retrospective case series. Endoscopy2003;35:333–7. Kruidenier L, Verspaget HW. Review article: oxidative stress as a pathogenic factor in inflammatory bowel disease—radicals or ridiculous? Aliment Pharmacol Ther2002;16:1997–2015. Kruidenier L, Kuiper I, Van Duijn W, et al. Imbalanced secondary mucosal antioxidant response in inflammatory bowel disease. J Pathol2003;201:17–27. Chanock SJ, el Benna J, Smith RM, et al. The respiratory burst oxidase. J Biol Chem1994;269:24519–22. Segal AW, Abo A. The biochemical basis of the NADPH oxidase of phagocytes. Trends Biochem Sci1993;18:43–7. Hausmann M, Spottl T, Andus T, et al. Subtractive screening reveals up-regulation of NADPH oxidase expression in Crohn’s disease intestinal macrophages. Clin Exp Immunol2001;125:48–55. Vaday GG, Lider O. Extracellular matrix moieties, cytokines, and enzymes: dynamic effects on immune cell behavior and inflammation. J Leukoc Biol2000;67:149–59. Hausmann M, Obermeier F, Spoettl T, et al. Cathepsin D contributes to mucosal damage in inflammatory bowel disease. Clin Exp Immunol2004;136:157–67. Bosi F, Silini E, Luisetti M, et al. Aspartic proteinases in normal lung and interstitial pulmonary diseases. Am J Respir Cell Mol Biol1993;8:626–32. Menzel K, Hausmann M, Schreiter K, et al. Prevention of tissue destruction as a new therapeutic target in IBD—effects of cathepsin-inhibitors [abstract]. Gastroenterology2005;128 (S1366) :A201. Silen W, Ito S. Mechanisms for rapid re-epithelialization of the gastric mucosal surface. Ann Rev Physiol1985;47:217–29. Komuro T. Re-evaluation of fibroblasts and fibroblast-like cells. Anat Embryol1990;182:103–12. Dignass AU, Tsunekawa S, Podolsky DK. Fibroblast growth factors modulate intestinal epithelial cell growth and migration. Gastroenterology1994;106:1254–62. Dignass AU, Lynch-Devaney K, Podolsky DK. Hepatocyte growth factor/scatter factor modulates intestinal epithelial cell proliferation and migration. Biochem Biophys Res Commun1994;202:701–9. Dignass AU. Mechanisms and modulation of intestinal epithelial repair. Inflamm Bowel Dis2001:68–77. Cho JH. Significant role of genetics in IBD: the NOD2 gene. Rev Gastroenterol Disord2003;3 (Suppl 1) :S18–22. Gasche C, Alizadeh BZ, Pena AS. Genotype-phenotype correlations: how many disorders constitute inflammatory bowel disease? Eur J Gastroenterol Hepatol2003;15:599–606. Helio T, Halme L, Lappalainen M, et al. 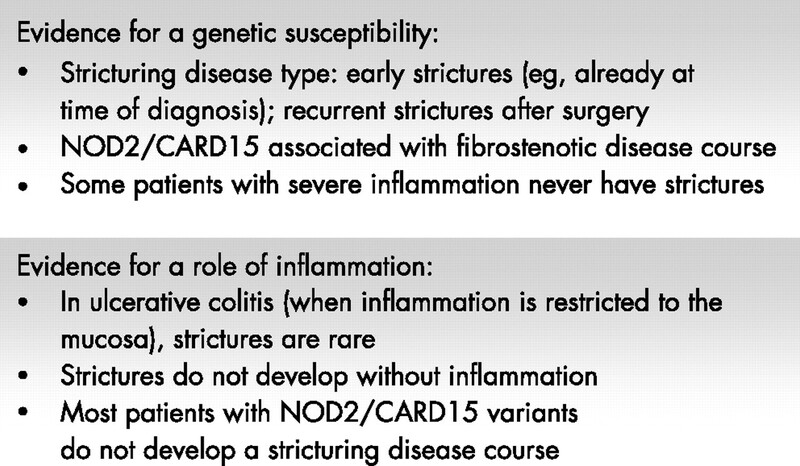 CARD15/NOD2 gene variants are associated with familially occurring and complicated forms of Crohn’s disease. Gut2003;52:558–62. Lesage S, Zouali H, Cezard JP, et al. CARD15/NOD2 mutational analysis and genotype-phenotype correlation in 612 patients with inflammatory bowel disease. Am J Hum Genet2002;70:845–57. Hugot JP, Zouali H, Lesage S. Lessons to be learned from the NOD2 gene in Crohn’s disease. Eur J Gastroenterol Hepatol2003;15:593–7. Louis E, Michel V, Hugot JP, et al. Early development of stricturing or penetrating pattern in Crohn’s disease is influenced by disease location, number of flares, and smoking but not by NOD2/CARD15 genotype. Gut2003;52:552–7. Sun L, Roesler J, Rosen-Wolff A, et al. CARD15 genotype and phenotype analysis in 55 pediatric patients with Crohn disease from Saxony, Germany. J Pediatr Gastroenterol Nutr2003;37:492–7. Otte JM, Rosenberg IM, Podolsky DK. Intestinal myofibroblasts in innate immune responses of the intestine. Gastroenterology2003;124:1866–78. Rogler G, Brand K, Vogl D, et al. Nuclear factor kappaB is activated in macrophages and epithelial cells of inflamed intestinal mucosa. Gastroenterology1998;115:357–69. Rogler G, Gelbmann CM, Vogl D, et al. Differential activation of cytokine secretion in primary human colonic fibroblast/myofibroblast cultures. Scand J Gastroenterol2001;36:389–98. Badid C, Mounier N, Costa AM, et al. Role of myofibroblasts during normal tissue repair and excessive scarring: interest of their assessment in nephropathies. Histol Histopathol2000;15:269–80. Sappino AP, Schurch W, Gabbiani G. Differentiation repertoire of fibroblastic cells: expression of cytoskeletal proteins as marker of phenotypic modulation. Lab Invest1990;63:148–61. Schmitt-Graff A, Desmouliere A, Gabbiani G. Heterogeneity of myofibroblast phenotypic features: an example of fibroblastic cell plasticity. Virchows Arch1994;425:13–24. Fries KM, Blieden TM, Looney RJ, et al. Evidence of fibroblast heterogeneity and the role of fibroblast subpopulations in fibrosis. Clin Immunol Immunopathol1994;72:283–92. Gabbiani G, Ryan GB, Majne G. Presence of modified fibroblasts in granulation tissue and their possible role in wound contraction. Experientia1971;27:549–50. Simon-Assmann P, Kedinger M, De Arcangelis A, et al. Extracellualr matrix components in intestinal development. Experientia1995;51:883–900. Eyden B. The myofibroblast: an assessment of controversial issues and a definition useful in diagnosis and research. Ultrastruct Pathol2001;25:39–50. Gabbiani G, Chaponnier C, Huttner I. Cytoplasmic filaments and gap junctions in epithelial cells and myofibroblasts during wound healing. J Cell Biol1978;76:561–8. Powell DW, Mifflin RC, Valentich JD, et al. Myofibroblasts. I. Paracrine cells important in health and disease. Am J Physiol1999;277:C1–19. Gressner AM. Transdifferentiation of hepatic stellate cells (Ito cells) to myofibroblasts: a key event in hepatic fibrogenesis. Kidney Int Suppl1996;54:S39–45. Brenner DA, Waterboer T, Choi SK, et al. New aspects of hepatic fibrosis. J Hepatol2000;32:32–8. Kedinger M, Duluc I, Fritsch C, et al. Intestinal epithelial-mesenchymal cell interactions. Ann N Y Acad Sci1998;859:1–17. Fritsch C, Simon-Assmann P, Kedinger M, et al. Cytokines modulate fibroblast phenotype and epithelial-stroma interactions in rat intestine. Gastroenterology1997;112:826–38. Watelet JB, Demetter P, Claeys C, et al. Wound healing after paranasal sinus surgery: neutrophilic inflammation influences the outcome. Histopathology2006;48:174–81. Motomura Y, Khan WI, El-Sharkawy RT, et al. Induction of a fibrogenic response in mouse colon by overexpression of monocyte chemoattractant protein-1. Gut2006;55:662–70. Vallance BA, Gunawan MI, Hewlett B, et al. TGF-beta1 gene transfer to the mouse colon leads to intestinal fibrosis. Am J Physiol Gastrointest Liver Physiol2005;289:G116–28. Wen FQ, Liu X, Kobayashi T, et al. Interferon-gamma inhibits transforming growth factor-beta production in human airway epithelial cells by targeting Smads. Am J Respir Cell Mol Biol2004;30:816–22. McKaig BC, Hughes K, Tighe PJ, et al. Differential expression of TGF-beta isoforms by normal and inflammatory bowel disease intestinal myofibroblasts. Am J Physiol Cell Physiol2002;282:C172–82. Lund PK. The alpha-smooth muscle actin promoter: a useful tool to analyse autocrine and paracrine roles of mesenchymal cells in normal and diseased bowel. Gut1998;42:320–2. Simmons JG, Pucilowska JB, Keku TO, et al. IGF-I and TGF-beta1 have distinct effects on phenotype and proliferation of intestinal fibroblasts. Am J Physiol Gastrointest Liver Physiol2002;283:G809–18. Jarnagin WR, Rockey DC, Koteliansky VE, et al. Expression of variant fibronectins in wound healing: cellular source and biological activity of the EIIIA segment in rat hepatic fibrogenesis. J Cell Biol1994;127:2037–48. Brenmoehl J, Lang M, Hausmann M, et al. The expression of fibronectin splicing-forms ED-A and ED-B is reduced in IBD mucosa [abstract]. Gastroenterology2003;124:A331. Leeb SN, Vogl D, Falk W, et al. Regulation of migration of human colonic myofibroblasts. Growth Factors2002;20:81–91. Leeb SN, Vogl D, Grossmann J, et al. Autocrine fibronectin-induced migration of human colonic myofibroblasts. Am J Gastroenterol2004;99:335–40. Leeb SN, Vogl D, Gunckel M, et al. Reduced migration of fibroblasts in inflammatory bowel disease: role of inflammatory mediators and focal adhesion kinase. Gastroenterology2003;125:1341–54. Suganuma H, Sato A, Tamura R, et al. Enhanced migration of fibroblasts derived from lungs with fibrotic lesions. Thorax1995;50:984–9. Pontz BF, Albini A, Mensing H, et al. Pattern of collagen synthesis and chemotactic response of fibroblasts derived from mucopolysaccharidosis patients. Exp Cell Res1984;155:457–66. Adelmann-Grill BC, Hein R, Wach F, et al. Inhibition of fibroblast chemotaxis by recombinant human interferon gamma and interferon alpha. J Cell Physiol1987;130:270–5. Pfeffer LM, Wang E, Tamm I. Interferon effects on microfilament organization, cellular fibronectin distribution, and cell motility in human fibroblasts. J Cell Biol1980;85:9–17. Brouty-Boye D, Cheng YS, Chen LB. Association of phenotypic reversion of transformed cells induced by interferon with morphological and biochemical changes in the cytoskeleton. Cancer Res1981;41:4174–84. Postlethwaite AE, Seyer JM. Stimulation of fibroblast chemotaxis by human recombinant tumor necrosis factor alpha (TNF-alpha) and a synthetic TNF-alpha 31–68 peptide. J Exp Med1990;172:1749–56. Schlaepfer DD, Hauck CR, Sieg DJ. Signaling through focal adhesion kinase. Prog Biophys Mol Biol1999;71:435–78. Sieg DJ, Hauck CR, Schlaepfer DD. Required role of focal adhesion kinase (FAK) for integrin-stimulated cell migration. J Cell Sci1999;112:2677–91. Matthes H, Herbst H, Schuppan D, et al. Cellular localization of procollagen gene transcripts in inflammatory bowel diseases. Gastroenterology1992;102:431–42. Stallmach A, Schuppan D, Riese HH, et al. Increased collagen type III synthesis by fibroblasts isolated from strictures of patients with Crohn’s disease. Gastroenterology1992;102:1920–9. Langberg CW, Sauer T, Reitan JB, et al. Relationship between intestinal fibrosis and histopathologic and morphometric changes in consequential and late radiation enteropathy. Acta Oncol1996;35:81–7. Mulsow JJ, Watson RW, Fitzpatrick JM, et al. Transforming growth factor-beta promotes pro-fibrotic behavior by serosal fibroblasts via PKC and ERK1/2 mitogen activated protein kinase cell signaling. Ann Surg2005;242:880–9. Wells RG. Fibrogenesis V. TGF-beta signaling pathways. Am J Physiol Gastrointest Liver Physiol2000;279:G845–50. Branton MH, Kopp JB. TGF-beta and fibrosis. Microbes Infect1999;1:1349–65. McKaig BC, McWilliams D, Watson SA, et al. Expression and regulation of tissue inhibitor of metalloproteinase-1 and matrix metalloproteinases by intestinal myofibroblasts in inflammatory bowel disease. Am J Pathol2003;162:1355–60. Theiss AL, Fruchtman S, Lund PK. Growth factors in inflammatory bowel disease: the actions and interactions of growth hormone and insulin-like growth factor-I. Inflamm Bowel Dis2004;10:871–80. Pucilowska JB, McNaughton KK, Mohapatra NK, et al. IGF-I and procollagen alpha1(I) are coexpressed in a subset of mesenchymal cells in active Crohn’s disease. Am J Physiol Gastrointest Liver Physiol2000;279:G1307–22. Zeeh JM, Riley NE, Hoffmann P, et al. Expression of insulin-like growth factor binding proteins and collagen in experimental colitis in rats. Eur J Gastroenterol Hepatol2001;13:851–8. Zeeh JM, Mohapatra N, Lund PK, et al. Differential expression and localization of IGF-I and IGF binding proteins in inflamed rat colon. J Recept Signal Transduct Res1998;18:265–80. Zimmermann EM, Sartor RB, McCall RD, et al. Insulinlike growth factor I and interleukin 1 beta messenger RNA in a rat model of granulomatous enterocolitis and hepatitis. Gastroenterology1993;105:399–409. Abrahamsson SO, Lundborg G, Lohmander LS. Recombinant human insulin-like growth factor-I stimulates in vitro matrix synthesis and cell proliferation in rabbit flexor tendon. J Orthop Res1991;9:495–502. Simmons JG, Pucilowska JB, Lund PK. Autocrine and paracrine actions of intestinal fibroblast-derived insulin-like growth factors. Am J Physiol1999;276:G817–27. Fruchtman S, Simmons JG, Michaylira CZ, et al. Suppressor of cytokine signaling-2 modulates the fibrogenic actions of GH and IGF-I in intestinal mesenchymal cells. Am J Physiol Gastrointest Liver Physiol2005;289:G342–50. Williams KL, Fuller CR, Fagin J, et al. Mesenchymal IGF-I overexpression: paracrine effects in the intestine, distinct from endocrine actions. Am J Physiol Gastrointest Liver Physiol2002;283:G875–85. Schuppan D, Hahn EG. MMPs in the gut: inflammation hits the matrix. Gut2000;47:12–14. Greenhalgh CJ, Miller ME, Hilton DJ, et al. Suppressors of cytokine signaling: relevance to gastrointestinal function and disease. Gastroenterology2002;123:2064–81. Michaylira CZ, Simmons JG, Ramocki NM, et al. Suppressor of cytokine signaling-2 limits intestinal growth and enterotrophic actions of IGF-I in vivo. Am J Physiol Gastrointest Liver Physiol2006;291:G472–81. Theiss AL, Fuller CR, Simmons JG, et al. Growth hormone reduces the severity of fibrosis associated with chronic intestinal inflammation. Gastroenterology2005;129:204–19. Ridderstrale M, Amstrup J, Hilton DJ, et al. SOCS-3 is involved in the downregulation of the acute insulin-like effects of growth hormone in rat adipocytes by inhibition of Jak2/IRS-1 signaling. Horm Metab Res2003;35:169–77. Alexakis C, Caruelle JP, Sezeur A, et al. Reversal of abnormal collagen production in Crohn’s disease intestinal biopsies treated with regenerating agents. Gut2004;53:85–90.